This is one of our best layouts for couples and small families. 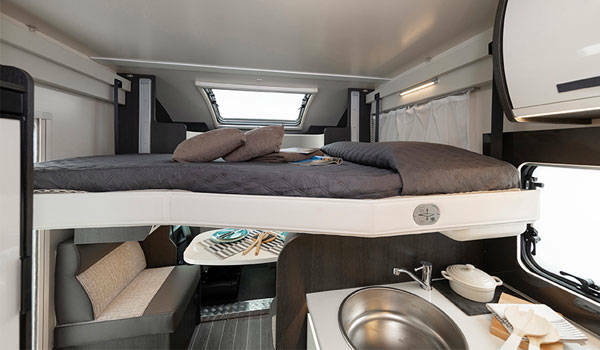 The separate bedroom with island bed at normal bed height provides comfort and privacy from the front of the vehicle. No ladders required to enter this bed. 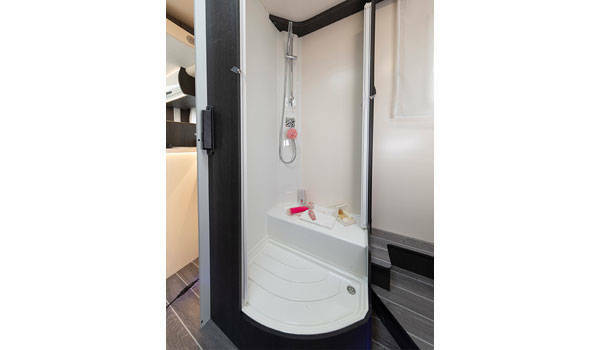 Shower and toilet are separate and are en-suite to the master bedroom. The shower is full size and the toilet has its own sink with vanity mirror and cabinets. 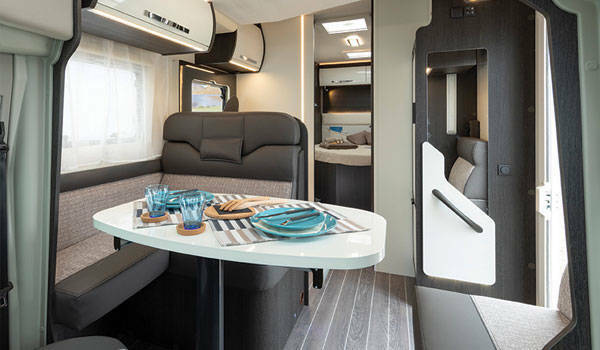 The double bed in the forward cabin is electrically lowered from the ceiling, neatly disappearing during the day and leaving a social space that will easily seat 5 or 6. 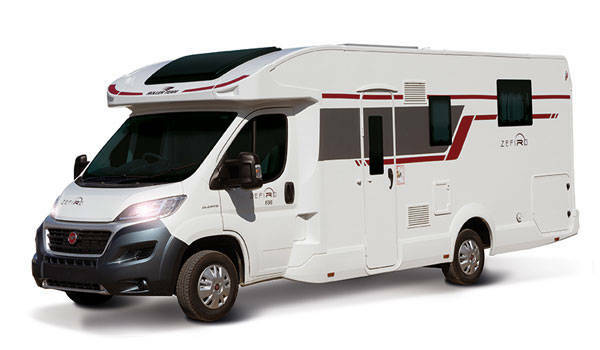 There is ample storage in this vehicle with 2 wardrobes either side of the master bed as well as ample storage under the bed, accessed externally. 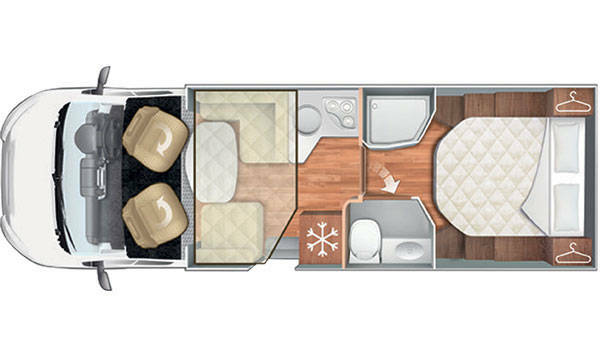 As with all our premier range motorhomes it comes very well specified internally. 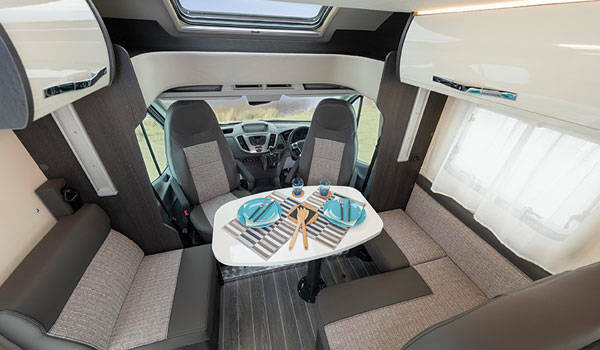 Although we think this vehicle is best for couples, wishing a bit more space, it can also be suitable for young families. The premier specification includes: A kitchen which boasts a near full size fridge with separate freezer compartment. Perfect for long trips away and irregular visits to the grocery store. 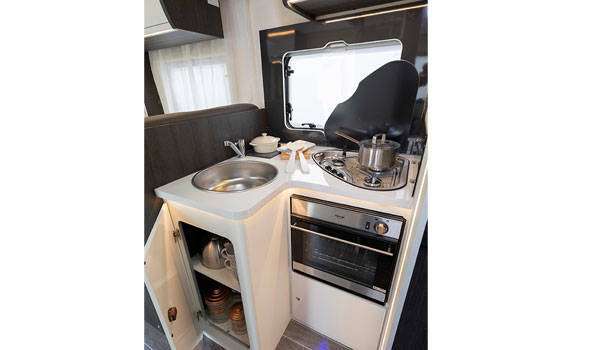 The cooking set up includes a 3 burner gas hob and combination grill and oven. This is also gas, allowing cooking away from campsites and hook up electrical supply. There is good storage in the kitchen for food. We supply all pots, pans, plates, cups, glasses, utensils and kettle. The TV/DVD is located in the bedroom. As with all our vehicles, all systems will operate when you are wild camping. This is perfect if you want a few days away from campsites and want to go touring further afield or to more remote spaces. This is aided by the powerful solar panel which keeps your battery levels topped up. 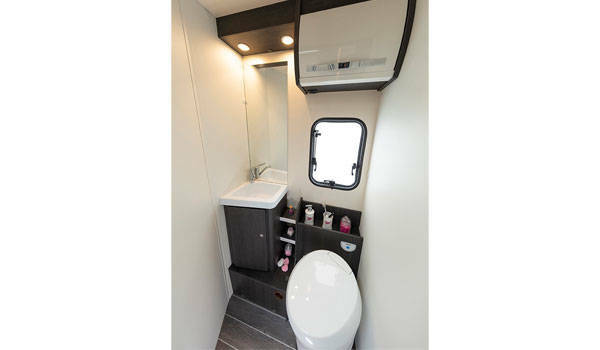 A front facing panoramic roof window and other roof hatches provides a light and airy feel into the cabin and bed area. As with all our vehicles you can drive this with a standard car licence. It is just over 7 metres long, which is still well suited to the roads of Scotland and the rest of the UK. At the rear is a colour reverse camera aiding parking. The bike rack on the rear can take 4 bikes securely. Bikes can also be hired from us if you cannot bring your own. From the outside you can access the storage space under the bed (you can access from the inside as well). There is a gas locker which will store 2 gas bottles. It is always comforting to have a gas cylinder in reserve. The vehicle has a low profile front end which helps reduce drag and provide a healthy fuel consumption (32-35 mpg). This vehicle feels light to drive and makes for a comfortable holiday with simple driving. As with all our vehicles, the main habitation door is on the passenger (safe) side of the vehicle, allowing for easy access from the kerbside. What is included with the vehicle? 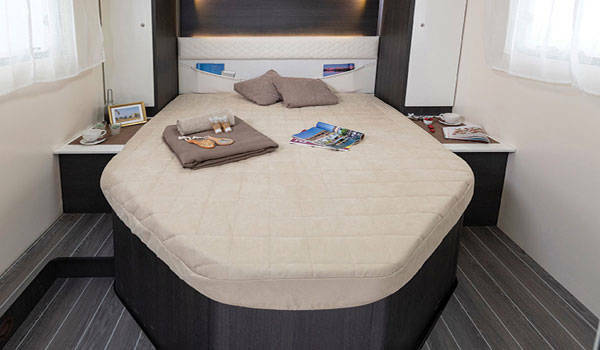 The island bed separated bedroom with separate lounge and well appointed kitchen with large fridge freezer make this a winner for couples and small families.